Could market squid become a new Southeast fishery? 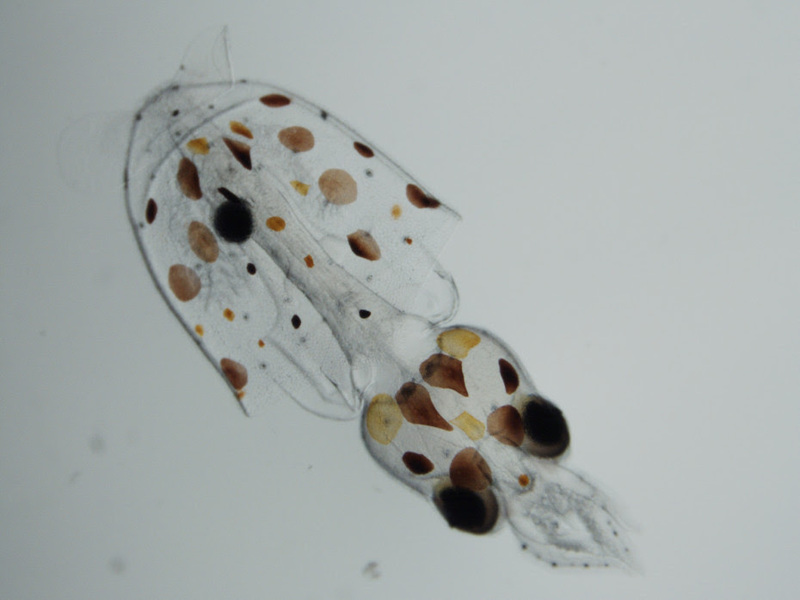 Southeast Alaska marine scientists got a rare peek this year into the hatching of a certain species of squid. “I’ve never seen it. In fact, I’ve never seen squid in Southeast and I’ve been here since 1976,” said Gordon Garcia. He works at the National Oceanic and Atmospheric Administration’s Ted Stevens Marine Research Institute in Auke Bay. Market squid eggs were found this past summer in a salmon capture device at the NOAAs Little Port Walter field station. That’s located on the eastern shore of the southern tip of Baranof Island. The squid are native to Southeast and are commercially harvested in California. But Garcia said this is the first time evidence of market squid spawning has been found at the research station, which has been there since the 1920s. “The squid actually spawned in the capture device and our staff there grabbed some of them,” Garcia said. The live squid died quickly, so he settled for eggs and began experimenting in July. I visited him in September. Garcia is a facilities manager at the institute, but he studied marine zoology in college and spent 30 years at the Alaska Department of Fish and Game. He’s curious to know if the squid can be cultured. 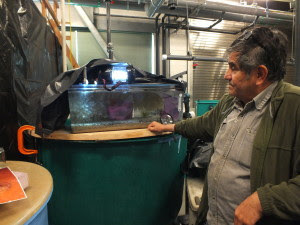 In the tanks where the squid eggs are kept, Garcia points out what he calls “squidleys,” also known as hatchlings. “We see this mass of squid hatching and they’re all attracted to the light,” Garcia said as we watched the squidleys dart around and swim. The eggs are housed in what looks like a puffy, translucent white sea anemone. About 30 to 40 eggs are in each finger. Garcia took an early photo of the first hatchlings that resembled an underwater tornado. He dubbed it “Squidnado” as an homage to recent cheesy sci-fi movies that mix weather phenomenon and marine life. The experiment is conducted in eight tanks. One of the tanks has water piped in from Auke Bay, which stays around 49 degrees Fahrenheit. In another tank, the water is warmed to 61 degrees. 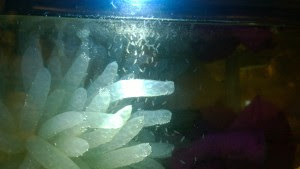 The eggs in the warmer tank hatched first but then died after about a week. Eggs in the cooler tank began to hatch about four weeks later. Garcia said market squid typically live about a year and grow to 8 to 10 inches long. “You could get those little calamari rings out of them. Yeah, dice them up,” he said, laughing. At one point, there were clouds of squidleys in the lab’s tanks, Garcia said. As many as 7,000 hatched between late summer and early fall. “They’re just popping out as we’re talking. You can see that cloud is getting denser and denser. If I were to go shake these egg masses, I’d probably triple the number of critters that you see there,” Garcia said. Garcia spent three months experimenting with the size of the tank, the kind of gravel at the bottom, water flow and food sources. The tricky part was getting the squid to eat. He tried salmon meal, rehydrated freeze-dried rotifers or a form of zooplankton and brine shrimp. Some of the cold water squid doubled in size after feeding on the brine shrimp, but the shrimp themselves did not thrive very well in the cold water. Sadly, despite Garcia’s attempts to keep the squidleys alive, the experiment only lasted about three months. The last one died Oct. 6.